IMPORTANT NOTE: This entry has been updated several times and reads in reverse chronological order. 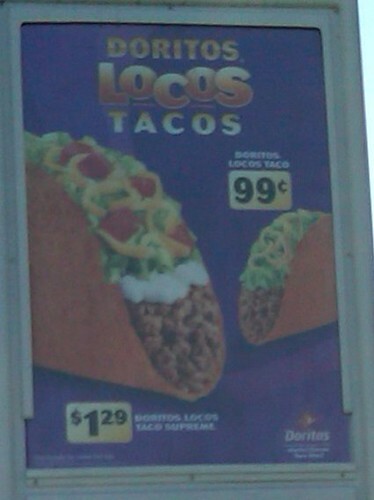 UPDATE (March 7, 2013): Cool Ranch Doritos Locos Tacos are available today at Taco Bell, presumably all locations. UPDATE (February 13, 2013): Have just been sent info from Taco Bell that the Cool Ranch Doritos Locos Tacos will be available in all (or most?) locations on March 7th. 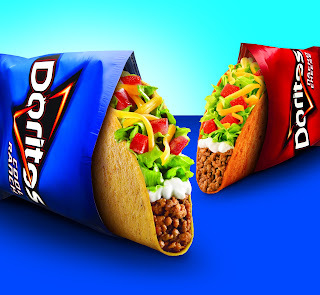 On March 7, 2013, Doritos Cool Ranch fans won’t have to wait any longer. 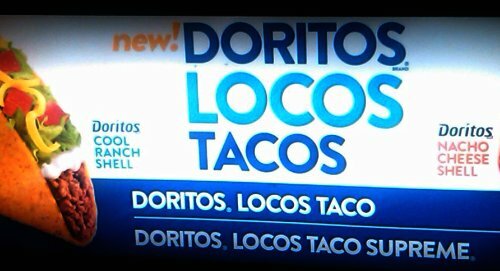 Today Taco Bell announced it will launch another soon-to-be blockbuster Doritos flavor to the Doritos Locos Tacos line-up: Cool Ranch Doritos Locos Tacos. The announcement was made today directly to Taco Bell’s most ardent fans across social and digital media channels, and via a six-second Vine video announcement, the first-ever product announcement made by Taco Bell using the Vine platform. Taco Bell plans to support the Cool Ranch Doritos Locos Tacos launch with its largest marketing campaign in history, topping the launch of the original Nacho Cheese Doritos Locos Tacos. Specific details of the marketing campaign will be released in the coming weeks. To gain consumer feedback and ensure the taco shell delivered on the same Cool Ranch taste and crunch consumers expect from Doritos, Cool Ranch Doritos Locos Tacos were tested in select restaurants in Toledo, Ohio for more than six months. To join in the conversation and keep in-the-know about Cool Ranch Doritos Locos Tacos, fans can tweet @TacoBell using #CoolRanchDLT and by staying tuned to youtube.com/tacobell. Cool Ranch Doritos Locos Tacos features a shell made out of Doritos Cool Ranch chips on the outside, filled with the classic tastes of the Taco Bell crunchy taco on the inside: 100 percent premium seasoned beef, crisp shredded lettuce and real cheddar cheese. Available exclusively at participating Taco Bell restaurants nationwide beginning March 7, 2013, the suggested retail price for the Cool Ranch Doritos Locos Tacos is $1.39 (160 calories; 10g total fat) and $1.69 for a Cool Ranch Doritos Locos Tacos Supreme (200 calories; 12g total fat) with reduced-fat sour cream and diced tomatoes. A Cool Ranch Doritos Locos Tacos $5 Buck Box will include a Doritos Locos Taco Supreme, Burrito Supreme®, Crunchy Taco and a medium fountain drink. For people looking for lower-calorie, lower-fat options, Cool Ranch Doritos Locos Tacos will be available Fresco Style with 140 calories and 7g total fat. For complete nutritional information after March 7, visit www.tacobell.com/nutrition/information. Taco Bell Corp., a subsidiary of Yum! Brands, Inc., (NYSE: YUM), is the nation's leading Mexican-inspired quick service restaurant. Taco Bell serves made to order and customizable tacos, burritos, and specialties such as the exclusive Doritos® Locos Tacos, gourmet inspired Cantina Bell® Menu and lower calorie Fresco Menu. The company encourages customers to “Live Más,” both through its food and in ways such as its Feed the Beat® music program and nonprofit organization, the Taco Bell Foundation for Teens. Taco Bell and its more than 350 franchise organizations have nearly 6,000 restaurants across the United States that proudly serve more than 36 million customers every week. 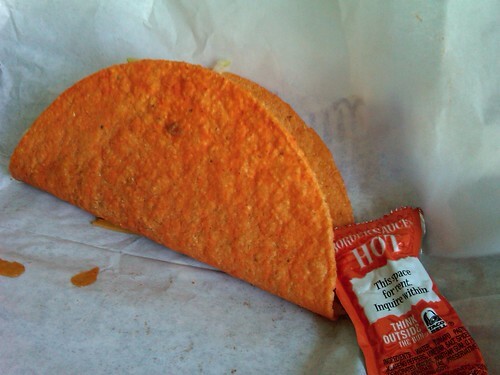 UPDATE (Late late March 8): Oh, man, this nutty Doritos taco saga just isn't ending. One of my brothers texted me about an hour ago and asked if I knew that I had been on TV. I thought he was just talking about seeing footage on the Register website but it turns out that that footage made it to Jon Stewart's Daily Show on Comedy Central where my statement at the launch party last night was featured as the nightly "Moment of Zen:"
My take on this is that I had actually had these tacos about a year and a half ago so I already knew what they were like and you can see below what my description is. The long and the short of it is that these things are Taco Bell tacos where the shell tastes like a Doritos chip. That is it. If you know what both of those taste like then you know what this new taco taste likes. So, a few days ago Nancy invited me to the launch party and I figured I would go. Two free tacos? Sure, I'll stoop to that. Free t-shirts and beanies at the end? Yeah, I'm fine with that too. When I arrived a videographer from The Register came up to me and said that she was planning on taping me taking my first bite and then asking me what I thought of it. This scared me in several different ways: First, I don't do well even for still photos so I am even worse on video; second, I had already tried these before so I already knew what they tasted like; and, third, there really is not that much to say about them. But then the videographer took off and I got occupied with the whole festive atmosphere there. I talked to some of the Taco Bell reps too and they were all very nice and one of them even asked me if I knew of any good Mexican restaurants around. It was very refreshing to see that they don't think of Taco Bell as the end-all and be-all of Mexican food because I always had the impression before that that is how they thought. A while later when the tacos were being served I got my taco and started opening it up when the Register's video person came back to me and said, "Wait! I need to get video of you taking your first bite." So I ended up like a deer caught in the headlights. I really didn't know what to say. After I took my first bite and they asked me how it was I blurted out, "It's like the biggest Doritos chip ever." Actually they took more video than that but that's what ended up on The Daily Show so that's all that really matters. I guess I inadvertently created a zen moment. If you're a Mexican restaurant in Orange County and you want me to provide strangely profound commentary on your food then I am open to it. I just prefer to do it in writing next time. The real star of the video above is that Matt Bustamante guy. UPDATE (Early early March 8): Just got back from the official launch party held at a Taco Bell location in the city of Orange. The party was sponsored by Nancy Luna, the famous Fast Food Maven blogger and reporter for The Orange County Register. About 50 of her invited guests were able to come and sample the new, inventive taco two hours before its launch to the general public at a rare midnight unveiling. Goodies such as t-shirts, beanies and key chains were also given out. For now only the Nacho Cheese kind is available but the Cool Ranch variety is expected to be released later this year. See Nancy's coverage of this event here where it is hinted that other Doritos flavors in addition to Nacho Cheese and Cool Ranch may be used as Taco Bell taco shells in the future. Cost: $1.29 for regular or $1.69 for supreme. 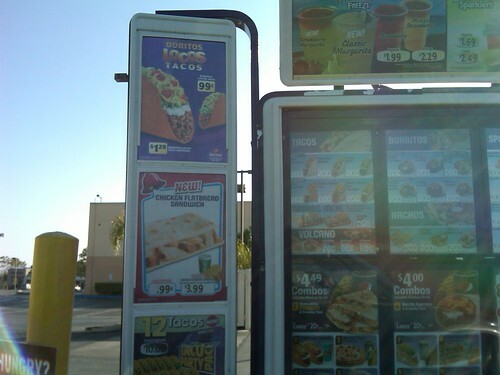 Soooo... back in September 2010 I'm driving by a Taco Bell and see a poster at their drive-thru menu board for Doritos Locos Tacos. I pull in, take a picture of the poster, try one of the tacos, mention it on Twitter and then never hear about the item again. Now in April 2011 the web is abuzz with everyone talking about these crazy things as though it's a brand new thing. Apparently somebody else even mentioned it a couple months before I did so I wasn't the first one but now these things are appearing at Taco Bells in Ohio and people are making videos of it and creating Facebook fan pages for it, etc. I guess when an item goes this viral then it's time for Taco Bell to put it in all their stores. Someone must know if they have them in/near the OC. Since I have a super sensitive tummy, I have used crushed doritos as the seasoning for my tacos for years instead of traditional seasoning and/or peppers. I have a bit of a problem with the spicier chips sometimes. Why can't they ever leave products alone? 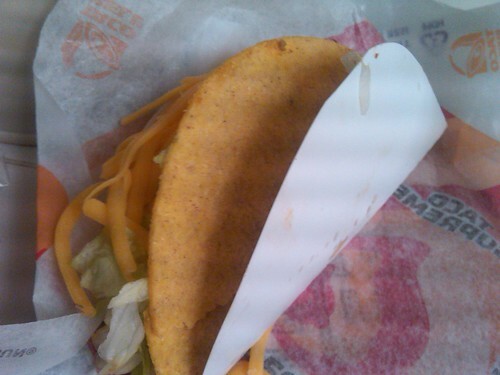 Judging by the online buzz I think we'll see this taco at all Taco Bells pretty soon. Sadly the location near The District no longer has Doritos Tacos. I tried today and was told they were discontinued 2 days ago. I bet they took it out because I told people where to go get it. I could tell people from Taco Bell were checking out my entry numerous times. Did I read that correctly? Taco Bell is accused of skimping on the beef, sales slump, so they plan a rebound based in part on a monstrosity like Doritos Locos Tacos, with shells made out of Doritos? Gag me with a spork! Listen up Taco Bell. Pull your head out of your marketing research and listen to your gut for once. The taco needs no reinvention. It's a perfect meal made from real, inexpensive foods: tortillas, meat, onions, cilantro and a splash of salsa. Maybe your idea will work in Iowa, but your HQ teeters precipitously close to the land where the taco was born. You won't fool the locals. That's why I'll continue to drive by two Taco Bells on my way to a neighborhood taco truck whose fifty-cent tacos surpass anything engineered in a marketing and innovation office. This was in the works before they were accused of skimping on the beef and a sales slump and there were also people who were requesting this item before they tested it. Hopefully Tacos el Chavito can expand. WHICH CAME FIRST.........RANCH.....OR COOL RANCH??????????? With Doritos I'm pretty sure the first Ranch flavor was called "Cool Ranch." But later they changed the name of the chips to "Cooler Ranch." The taco had goes back to the original name. If I could get these delivered by the TacoCopter (tacocopter.com), my life would be complete. 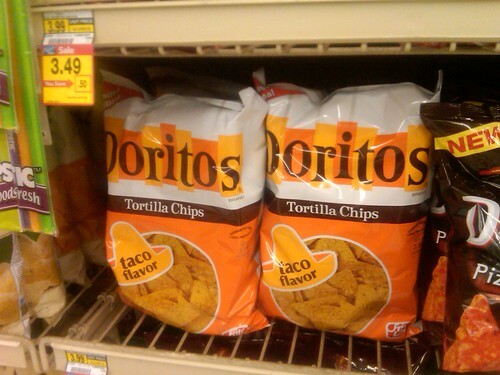 Everyone thinks that the Taco flavor that Doritos has now is new. This flavor is not new. It is from 1967. This flavor has been around for ever! They just brought it back from the Frito Lay graveyard. The bag that this flavor is in now is what the original bag looked like back in 1967. That's why I put "new" in quotes. Its crap like their rest of their food. Salad dishes with a straw full of meat in each. You notice none of the pictures of the taco here does not show what little meat is in them like the rest of their foods. Its a shame Taco bell has to keep coming out with with new foods to keep customers when all they have to do it actually put at least half the meat they show on their adverts. I guess a solution is to make your own taco with as much beef as you want and eat it with Cool Ranch chips.